I took the time to. Take the time to read the full item description. And to look at all of the pictures. I do not use Stock Photos! I take the time to take new & accurate photos of each individual item I sel l. Not alter or enhance my pictures. Is the item/figure you will get! 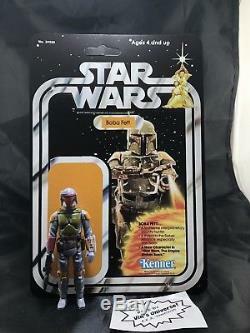 Custom Vintage Action Figures in the Universe! (Google: Vinny0026 Mego to see my Custom Megos). I have been Customizing figures since the 1980s and have decades of experience! 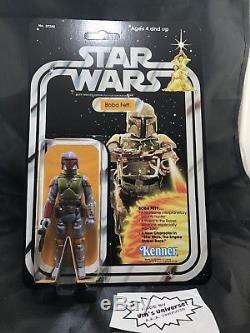 Star Wars figures and Cardbackers are the Closest & Most Accurate you will get to an Original MOC Figure and will cost you thousands less than an all original! Only to be used for. To be sent to AFA to be Graded! They are made for people who collected & played with these figures when they were children and they would like to collect and display them again for Nostalgia Purposes but refuse to spend Thousands of Dollars for a toy/figure! 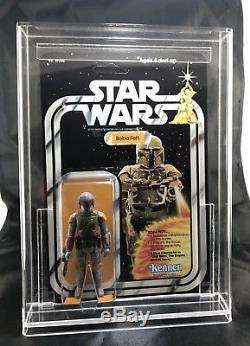 Please Understand All Original MOC AFA Graded figures would cost you Thousands of Dollars! And Mine Look Exactly the same -If not better for a fraction of the price! This Holiday Season - Give the Gift of the Force! 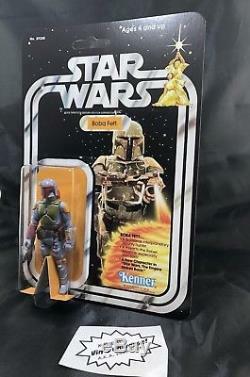 An Original 1979 Star Wars Boba Fett Bounty Hunter. The figure comes with and already placed inside the Amazing Acrylic Display Case! 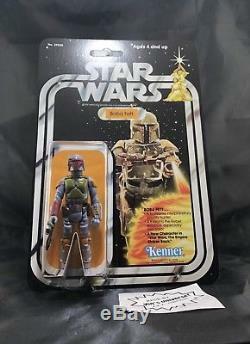 The Figure: is Original and made by Kenner in 1978/79. He is in Excellent Condition! I only cleaned this one up a little and touched up his belt as it was in AMAZING Condition he has just a few tiny nicks on the cheat but over all he looks great! Please see all the pictures and judge for yourself! I do not alter them in any way other than cropping them! He comes with a Super High Quality Reproduction Blaster Weapon. The Blaster is made from the same process and molds as the originals. They look and feel just like the originals. 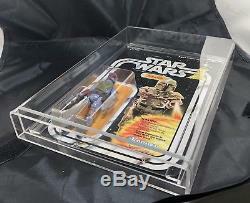 Of the original Star Wars The Empire Strikes Back - 41 Back - Cardbacker and is in Perfect condition! These Cardbackers are intentionally made to Look & Feel Vintage/Authentic! (Intentionally slightly worn/faded to appear as they were printed in the 1970s & 80's). They are also the same size and weight as the original cardbackers. They are the closest cards you will ever get to the originals - The very best you will ever find! Laser Printed straight to the cardstock! Just like they were made in the 1977. My Cardbackers come to look "Unpunched" If you want it to look "Punched". Just push out the tab for the peg holder with your. Finger and it will fall right out. But Please note: these bubbles are. So sometimes there may be a few tiny scratches or a tiny scuff on them - but noting to nit pick about. Amazing Custom made Display Piece! Figure comes already inserted in the. Amazing High Quality GW Acylics USA Display cases! The BEST cases on the Market! They are the top of the line and have Museum Style Quality! They are a sleek design - not just a Box/Square Design. These are rounded off a little in the front which really is top notch! Will not do them any justice. Because when you try and snap pictures of them with the figure inside - you get a lot of back ground reflections on the case. They also open and close if you wanted to take the figure in and out of it - But I would. You run the risk of damaging the Figure, Cardbacker, Bubble or Case! Amazing Custom made Display Piece. At a fraction of the cost of an original. There are hundreds more if you scroll through my feedback page. 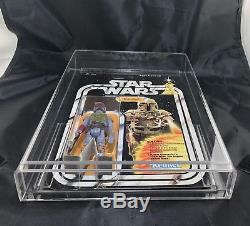 Custom Star Wars ESB 41 Back FX-7 Medical Droid figure MOC Display Piece (#332579057292). Custom Vintage Style Star Wars TFA Han Solo Movie MOC Display Piece (#332551129251). Well made and well packed. Custom Vintage Style Star Wars Rogue One Imperial Stormtrooper MOC Display Piece (#323069222973). My no 1 source for Star Wars!! Custom Vintage Star Wars 12 back Princess Leia Organa figure MOC Display Piece (#332555180200). 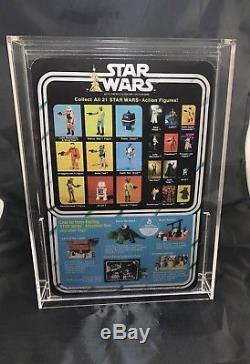 Custom Vintage Star Wars 12 back Sand People figure MOC Display Piece (#323056150339). 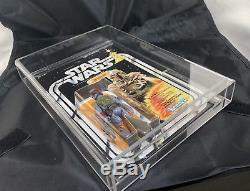 Custom Vintage Star Wars 12 back Princess Leia Organa figure MOC Display Piece (#332566851115). 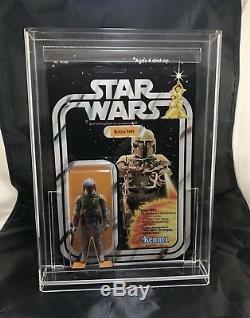 Custom Vintage Star Wars 12 back Luke Skywalker DT Double Telescoping figure MOC (#323110236887). Custom Vintage Style Disney Star Wars Rebels Grand Inquisitor Figure Display (#332574499807). Custom Vintage Star Wars 12 back Darth Vader DT Double Telescoping figure MOC (#323068209560). Custom Vintage Star Wars Display Piece Princess Leia as Jabba's Prisoner Slave (#332545937100). Will do business with again. Custom Vintage Style Disney XD Star Wars Rebels Ezra Bridger MOC Display Piece (#323068874299). If you have any questions please feel free to ask me, we will be happy to get back to you with an answer. 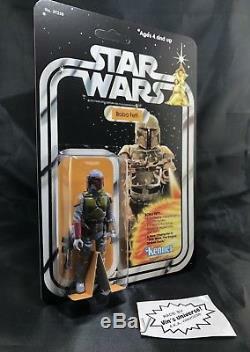 The item "Vintage Star Wars 1979 Boba Fett Action Figure MOC on Custom 21 Back With Case" is in sale since Tuesday, December 4, 2018. This item is in the category "Toys & Hobbies\Action Figures\TV, Movie & Video Games". The seller is "vinsuniverse" and is located in Staten Island, New York. This item can be shipped to United States, Canada, United Kingdom, Denmark, Romania, Slovakia, Bulgaria, Czech republic, Finland, Hungary, Latvia, Lithuania, Malta, Estonia, Australia, Greece, Portugal, Cyprus, Slovenia, Japan, Sweden, South Korea, Indonesia, Taiwan, Thailand, Belgium, France, Hong Kong, Ireland, Netherlands, Poland, Spain, Italy, Germany, Austria, Bahamas, Israel, Mexico, New Zealand, Philippines, Singapore, Switzerland, Norway, Saudi arabia, Ukraine, United arab emirates, Qatar, Kuwait, Bahrain, Croatia, Malaysia, Chile, Colombia, Costa rica, Dominican republic, Panama, Trinidad and tobago, Guatemala, El salvador, Honduras, Jamaica, Antigua and barbuda, Aruba, Belize, Dominica, Grenada, Saint kitts and nevis, Saint lucia, Montserrat, Turks and caicos islands, Barbados, Bangladesh, Bermuda, Brunei darussalam, Bolivia, Egypt, French guiana, Guernsey, Gibraltar, Guadeloupe, Iceland, Jersey, Jordan, Cambodia, Cayman islands, Liechtenstein, Sri lanka, Luxembourg, Monaco, Macao, Martinique, Maldives, Nicaragua, Oman, Pakistan, Paraguay, Reunion.